Characters: 4.5 Justyce is an awesome POV character. He's very introspective and into understanding the many layers that make up his views of the world. He grew up in an underprivileged neighborhood and was well aware of gang violence, but since getting a scholarship to a private boarding school, he's been focused on thriving in his education. Being forced to realize that he's not removed from the horrific and violent stories he's read shakes him. His two friends, Manny and Sarah-Jane fill out the picture of his life in contrast. Manny has always gone to fancy private school. He drives a Range Rover, and his parents make more than most of his classmates. It creates a real conflict in his identity as he grew up surrounded by almost all white kids and their point of view. He's been conditioned to accept the racism, and he initially can't understand why Justyce gets so fired up about their racist commentary. SJ is Jewish and a very vocal supporter of Justyce and civil rights. She's sharped tongued, and, initially, more empowered than Manny to tell her classmates to shut up. She realizes that this is the case because of her privilege. She makes a point to use her voice for good, much like Doc their debate teacher who is a mentor for Justyce. While I'd have liked to have gotten to know the background characters more, I loved the major players. Plot: 4.5 The book is short and to the point. As the shooting takes place right around page 100, you've already gotten to see the characters evolve and awaken. The story is powerful and shaking. Scenes will stir lots of emotion, mostly anger. I nearly had to put the book down during the scene where Justyce is questioned in his best friend's murder trial. You're not going to put the book down until you've turned the very last page. 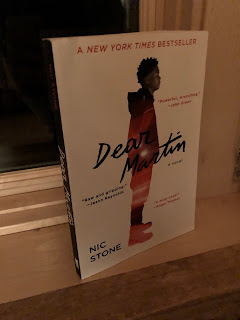 Writing: 5 I picked up the book after listening to Nic Stone talk on First Draft pod, and I couldn't believe I hadn't read her book yet. I knew that her beautiful articulation in the interview would translate to the page, and I was right. The third person prospective did nothing to stifle Justyce's unique voice from shining through. Like The Hate U Give, Stone fully amerces you in the action and the world.